THERMOFUEL V9 CLINICAL STRENGTH THERMOGENIC FOR HER! Our first version of ThermoFuel was launched in 1998 as a powerful thermogenic fat burner, and after 17 years of continuous development, our newest version, V9, is the strongest yet. If you are serious about making a change in your body and have started eating healthier and exercising, then ThermoFuel V9 can help you reach your goals. ThermoFuel V9 contains key nutrients that can enhance your body's ability to become lean. These nutrients are specifically formulated to target multiple aspects of weight loss, including appetite stabilization, improved metabolism, fat blocking, insulin control, blood sugar stabilization, and fat utilization. 500mg Acetyl L-Carnitine - Without Carnitine, fats cannot be metabolized. Carnitine escorts body fats to the mitochondria where they can be broken down. 315mg Green Tea Leaf Extract - Massively ramps up metabolism to speed the fat-burning process while also releasing epinephrine to enhance focus and release body fat stores. 200mg L-Tyrosine - Shown to successfully suppress appetite and increase focus and mental energy. 142mg EGCG - Helps maintain a higher metabolism by keeping norepinephrine, the neurotransmitter responsible for regulating metabolism, at peak levels. 120mg Infinergy™ DiCaffeine Malate - Caffeine is well-known, but this is not your typical caffeine. The addition of malate to two caffeine molecules smooths any agitation from and prolongs the metabolic-boosting effects of caffeine. 60mg Advantra Z® Synephrine - Structurally similar to ephedrine, which gives it the capability of increasing fat oxidation without the negative side effects. 50mg Banaba Leaf Extract - Inhibits the uptake (digestion and absorption) of carbohydrates and can also aid in their deposition into cells from the blood stream (resulting in a reduction in blood sugar). 50mg Cayenne Pepper - Promotes the mobilization of fats for energy production (a process called lipolysis), and thermogenesis by generating heat in the body. 40mg Theobromine - When theobromine is absorbed by the body, it activates an insulin signaling pathway, which causes a mild increase in glucose uptake. Like all NutraBio products, ThermoFuel V9 does not use proprietary blends to hide the real dosage of its ingredients. Each active ingredient in this formula is in its full therapeutic dosage, which is fully disclosed on the label. In addition, ThermoFuel V9 contains no additives, fillers, or excipients. We made these quality commitments over 15 years ago because we believe you have the right to know exactly what you're putting in your body. 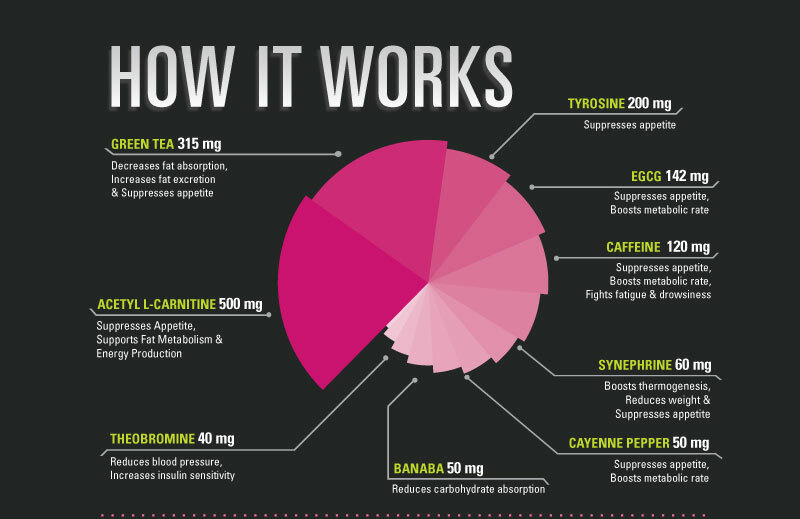 Caffeine-containing supplements have been investigated in relation to their ability to increase resting metabolic rate. Previous research has reported that caffeine and caffeine-containing supplements are able to acutely increase resting metabolic rate. Even low doses of caffeine (100 mg) have been reported to significantly increase resting metabolic rate by approximately 4% over a 2.5-hour period following ingestion. The magnitude of the resting metabolic rate response is linear with increasing dosages of caffeine intake. Specifically, doses of approximately 100 mg, 200 mg, and 400 mg of caffeine have been shown to significantly increase resting metabolic rate up to a 3-hour period by about 4%, 11%, and 16%, respectively. In addition to its impact on metabolic rate, caffeine can affect substrate utilization during exercise. In particular, research findings suggest that during exercise, caffeine acts to decrease reliance on glycogen utilization and increase dependence on free fatty acid mobilization. Essig et al. reported a significant increase in intramuscular fat oxidation during leg ergometer cycling when subjects consumed caffeine at an approximate dose of 5 mg/kg. Additionally, Spriet et al. demonstrated that following ingestion of a high dose of caffeine (9 mg/kg), net glycogenolysis was reduced at the beginning of exercise (cycling to exhaustion at 80% VO2max). Consequently, performance was significantly improved. The results of this study suggested an enhanced reliance on both intra- and extramuscular fat oxidation. In addition to caffeine, green tea extract has also been investigated for its potential to elevate resting metabolic rate. Specifically, these investigations have reported that green tea extract significantly elevates 24-hour energy expenditure, possesses thermogenic properties, and promotes fat oxidation beyond that explained by its caffeine content. In addition, tea ingestion resulted in significantly more fat oxidation (12%) compared to a water control. Thermogenics are compounds designed to amplify body heat production, thereby increasing energy expenditure and promoting weight loss. One such compound is epigallocatechin gallate, also known as EGCG. EGCG has been theorized to increase energy expenditure by stimulating brown adipose tissue thermogenesis. In support of this theory, Dulloo et al. reported that EGCG in combination with caffeine (e.g., 50 mg caffeine and 90 mg epigallocatechin gallate taken three times per day) significantly increased 24-hour energy expenditure and fat utilization in humans to a much greater extent than when an equivalent amount of caffeine was evaluated, suggesting a synergistic effect. Recently, Di Pierro et al. reported that the addition of EGCG to a hypocaloric diet resulted in a significant increase in weight loss (14 kg vs. 5 kg) versus a hypocaloric diet alone over a 90-day clinical trial. Theoretically, the increases in energy expenditure via EGCG supplementation may help individuals lose weight and/or manage body composition. A second thermogenic compound in ThermoFuel V9 is cayenne pepper. Studies suggest that chemical compounds in cayenne have the ability to increase the body's heat production, thus increasing the rate of metabolism of fats and carbohydrates. Additional research also indicates that cayenne increases the production of epinephrine and norepinephrine, which together decrease appetite. For dieters, it has been suggested that adding cayenne to a day's diet reduces hunger after meals and reduces calories consumed during subsequent meals. The last thermogenic compound added in ThermoFuel V9 is the patented compound Advantra Z®. Because Advantra Z® contain synephrine, it is able to stimulate thermogenesis, increase lipolysis to facilitate the burning of fats for fuel, reduce weight, increase lean muscle mass, and suppress appetite. Advantra Z® also improves athletic performance and uptake of amino acids into muscle cells. Advantra Z® offers many of the metabolic-enhancing effects of ephedrine without the dangerous side effects. Unlike ephedrine, Advantra Z® does not influence alpha-1, alpha-2, beta-1, or beta-2 receptors, which affect blood pressure and heart rate, making it a safe and effective tool for weight loss. Advantra Z® only stimulates beta-3 adrenergic receptors, which increase lipolysis in fat tissue and thermogenesis in skeletal muscle. Carnitine plays an important role in converting stored body fat into energy. Carnitine's primary function is to regulate fat metabolism and transport fatty acids into the mitochondria of cells, where they are oxidized and converted into energy. Studies suggest that athletes may need more carnitine than their body can produce, so supplementing with carnitine can lead to improved exercise capacity and a reduction in stored body fat. During intense exercise, carnitine may help reduce the respiratory exchange ratio and lactic acid buildup in muscles, leading to increased energy and greater resistance to muscle fatigue. Put simply, carnitine helps your body burn its own stored fat as energy, leading to increased endurance, work output, and exercise capacity. Studies show that it may even preserve muscle glycogen during exercise, keeping you energized even longer. ThermoFuel V9 contains acetyl-L-carnitine, which is a stabilized and more bioavailable form of the amino acid L-carnitine. The addition of the acetyl group to the L-carnitine molecule allows it to easily pass through the blood-brain barrier, where it plays an important role in protecting and supporting brain function. Acetyl-L-carnitine is involved in aspects of neuronal metabolism because its molecular structure resembles the neurotransmitter acetylcholine. Supplementing with acetyl-L-carnitine may improve production of acetylcholine and stimulation of protein and membrane phospholipid synthesis. Although many of the other active ingredients found in ThermoFuel V9 act as appetite suppressants, L-tyrosine may exhibit the strongest effects when it comes to curbing hunger. This is due to its role in the production of the dopamine, epinephrine, and norepinephrine. These neurotransmitters help create a sense of satiation (feeling of fullness), which in turn help reduce cravings. Furthermore, supplementing with L-tyrosine may be an effective way to safely boost the metabolism of overweight and obese individuals. Tyrosine has been shown to influence the production of thyroid hormone levels, specifically thyroxin, a hormone that regulates the body's metabolic rate. Maximizing fat loss and achieving a lean, hard physique requires putting in work at the gym and in the kitchen. ThermoFuel is not a magic pill like other brands claim, however along with proper diet and exercise it can give you that extra push. The clinically dosed ingredients found in ThermoFuel V9 create a synergistic combination, working together to make your dieting and training efforts more effective. With ThermoFuel V9, you don't need to worry about cutting through all the bull; NutraBio has done that for you with our fully transparent label! All that's left to do is to let ThermoFuel V9 cut through the fat. What is the best way to take ThermoFuel V9 for Women? To assess your tolerance, take one capsule with 8 oz. of water once per day. Once your tolerance has been assessed, take 2 capsules 2 times daily 30-60 minutes before meals. For best results use for 8 weeks in conjunction with a calorie-reduced diet and regular exercise. Consume 8-10 glasses of water daily. Do not snack between meals. If you are sensitive to caffeine, do not take within 5 hours of bedtime. Who are fat loss products for? Fat burners are created for anyone trying to decrease body fat. They often have ingredients designed to enhance your metabolism and to burn up stored fat. A fat burner can assist you greatly in getting into better shape and to motivate you with quickly noticeable results. I see ThermoFuel V9 for Women may help me increase my metabolism. What will that do for weight/fat loss? Anytime you have an increase in metabolism your body will burn more calories at rest and during exercise. If you burn more calories than you consume on a daily basis you will lose weight/fat over time. Thermogenesis is the simplest sense is production of heat in the human body which can have a calorie/fat burning effect. Can I stack my pre-workout with ThermoFuel V9 for Women? If your pre-workout does not contain any stimulants it is ok to stack it with ThermoFuel V9. However, if your pre-workout contains high amounts of caffeine or other stimulants we suggest not taking ThermoFuel with it unless taken 8 hours apart. What other NutraBio products do you recommend taking with ThermoFuel V9 for Women? In order to promote optimal fat loss and gains in lean muscle mass we recommend stacking ThermoFuel with our 100% Whey Protein Isolate, IntraBlast, Reload, and MultiSport. Suggested Use: To assess your tolerance, take one capsule with 8 oz. of water once per day. Once your tolerance has been assessed, take 2 capsules 2 times daily 30-60 minutes before meals. For best results use for 8 weeks in conjunction with a calorie-reduced diet and regular exercise. Consume 8-10 glasses of water daily. Do not snack between meals. If you are sensitive to caffeine, do not take within 5 hours of bedtime. WARNING: NOT FOR USE BY PERSONS UNDER THE AGE OF 18. Do not use if you are pregnant or breast feeding. Consult your physician prior to use if you have any medical condition, including but not limited to high blood pressure, cardiac arrhythmia, myocardial infarction, stroke, diabetes, hypoglycemia or heart, liver, kidney or thyroid disease, or if you are taking medication, including but not limited to MAO inhibitors. Discontinue use and immediately consult your physician if you experience any adverse reactions including but not limited to rapid heartbeat, dizziness, severe headaches or shortness of breath. Do not consume synephrine, caffeine or thyroid-boosting compounds from other sources, including but not limited to, coffee, tea, soda and other dietary supplements or medications containing phenylephrine or caffeine or any stimulants whatsoever. Never exceed the recommended maximum dosage. Do not use this product for longer than 2 months. Contains caffeine. KEEP OUT OF THE REACH OF CHILDREN. If you are a professional, college, or amateur athlete whose given sports conduct in and out of competition random drug screens, this product contains synephrine which should not be taken. It is possible this compound could lead to a positive drug test for certain banned substances. I started using Thermot Fuel as part of a 90 day challenge. Almost i year later and I still take it at least once a day, depending on Pre-Workouts I use. I take twice a day if I need to clean up my diet after long weekend. Thermo Fuel powers me through the low energy parts of my day and makes it easier to eat clean and not blow my diet late in the day or after evening workouts. I take it by 3 pm so I'm not amped up at bed time. Diepvens, K., et al. Obesity and thermogenesis related to the consumption of caffeine, ephedrine, capsaicin, and green tea. Am J Physiol Regul Integr Comp Physiol. 292(1):R77-85, 2007. Nagao, T., et al. Ingestion of a tea rich in catechins leads to a reduction in body fat and malondialdehyde-modified LDL in men. Am J Clin Nutr 81: 122-129, 2005. Muller, D. M., et al. Effects of oral L-carnitine supplementation on in vivo long-chain fatty acid oxidation in healthy adults. Metabolism 51(11):1389-91, 2002. Hursel, R., et al. The effects of green tea on weight loss and weight maintenance: a meta-analysis. International Journal of Obesity 33, 956-961, 2009. Stephens, F. B., et al. New insights concerning the role of carnitine in the regulation of fuel metabolism in skeletal muscle. The Journal of Physiology 581: 431-444, 2007. Nagao, T., et al. Tea catechins suppress accumulation of body fat in humans. J Oleo Sci 50: 717-728, 2001. Berube-Parent. S., et al. Effects of encapsulated green tea and Guarana extracts containing a mixture of epigallocatechin-3-gallate and caffeine on 24 h energy expenditure and fat oxidation in men. Br J Nutr 94: 432-436, 2005. Dulloo, A G., et al. Efficacy of a green tea extract rich in catechin-polyphenols and caffeine in increasing 24-h energy expenditure and fat oxidation in humans. Am J Clin Nutr 70: 1040-1045, 1999. Choo, J. J. Green tea reduces body fat accretion caused by high-fat diet in rats through beta-adrenoceptor activation of thermogenesis in brown adipose tissue. J Nutr Biochem 14: 671-676, 2003. Gougeon, R., et al. Increase in the thermic effect of food by adrenergic amines extracted from Citrus aurantium. Obesity Research 13(7):1187-94, 2005. Zenk, J. L., et al. Effect of multi-ingredient weight-loss product on metabolic rate and body composition. Nutrition 21:179-185, 2005. Ahmed, S-U., et al. Green tea polyphenol epigallocatechin-3-gallate (EGCG) differentially inhibits interleukin-1 beta-induced expression of matrix metalloproteinase-1 and -13 in human chondrocytes. J Pharmacol Exp Ther. 2004 Feb;308(2):767-73. Acheson, K. J., et al. Caffeine and coffee: their influence on metabolic rate and substrate oxidation in normal weight and obese individuals. Am J Clin Nutr 33: 989-997, 1980. Chantre, P. and Lairon, D. Recent findings of green tea extract AR25 (Exolise) and its activity for the treatment of obesity. Phytomedicine 9: 3-8, 2002. Henry, C. J. and Emery, B. Effect of spiced food on metabolic rate. Hum Nutr Clin Nutr 40: 165-168, 1986. Hase, T., et al. Anti-obesity effects of tea catechins in humans. J Oleo Sci 50: 599-605, 2001. Shixian, Q., yet al. Green tea extract thermogenesis-induced weight loss by epigallocatechin gallate inhibition of catechol-O-methyltransferase. J Med Food. 2006 Winter;9(4):451-8. Maki, K. C., et al. Green tea catechin consumption enhances exercise-induced abdominal fat loss in overweight and obese adults.J Nutr. 2009 Feb;139(2):264-70. Venables, M. C. Green tea extract ingestion, fat oxidation, and glucose tolerance in healthy humans.Am J Clin Nutr. 87(3):778-84, 2008. Bracco, D., et al. Effects of caffeine on energy metabolism, heart rate, and methylxanthine metabolism in lean and obese women. Am J Physiol Endocrinol Metab 269: E671-E678, 1995. Dulloo, A. G., et al. Normal caffeine consumption: influence on thermogenesis and daily energy expenditure in lean and postobese human volunteers. Am J Clin Nutr 49: 44 -50, 1989. Astrup, A., et al. Caffeine: a double-blind, placebo-controlled study of its thermogenic, metabolic, and cardiovascular effects in healthy volunteers. Am J Clin Nutr 51: 759-767, 1990. Hollands, M. A., et al. A simple apparatus for comparative measurements of energy expenditure in human subjects: the thermic effect of caffeine. Am J Clin Nutr 34: 2291-2294, 1981. Astrup, A. and Toubro, S. Thermogenic, metabolic, and cardiovascular responses to ephedrine and caffeine in man. Int J Obes Relat Metab Disord 17 Suppl 1: S41-S43, 1993. Yoshioka, M., et al. Effects of red pepper added to high-fat and high-carbohydrate meals on energy metabolism and substrate utilization in Japanese women. Br J Nutr 80: 503-510, 1998. Lejeune, M. P. G. M., et al. Effect of capsaicin on substrate oxidation and weight maintenance after modest body-weight loss in human subjects. Br J Nutr 90: 1-10, 2003. Dulloo, A. G. Ephedrine, xanthines and prostaglandin-inhibitors: actions and interactions in the stimulation of thermogenesis. Int J Obes Relat Metab Disord 17 Suppl 1: S35-S40, 1993. Hogervorst E, et al., "Caffeine improves physical and cognitive performance during exhaustive exercise." Med Sci Sports Exerc. 2008 Oct;40(10):1841-51. Deijen, J. B., et al. Tyrosine improves cognitive performance and reduces blood pressure in cadets after one week of a combat training course. Brain Res Bull. 1999 Jan 15;48(2):203-9. Kawada, T., et al. Capsaicin-induced beta-adrenergic action on energy metabolism in rats: influence of capsaicin on oxygen consumption, the respiratory quotient, and substrate utilization. Proc Soc Exp Biol Med 183: 250-256, 1986. Yoshioka, M., et al. Effects of red-pepper diet on the energy metabolism in men. J Nutr Sci Vitaminol (Tokyo) 41: 647-656, 1995. Watanabe, T., et al. Capsaicin, a pungent principle of hot red pepper, evokes catecholamine secretion from the adrenal medulla of anesthetized rats. Biochem Biophys Res Commun 142: 259-264, 1987. Osaka, T., et al. Thermogenesis mediated by a capsaicin-sensitive area in the ventrolateral medulla. Neuroreport 11: 2425-2428, 2000. Yoshida T., et al. Effects of capsaicin and isothiocyanate on thermogenesis of interscapular brown adipose tissue in rats. J Nutr Sci Vitaminol (Tokyo) 34: 587-594, 1988. Kawada, T., et al. Effects of capsaicin on lipid metabolism in rats fed a high fat diet. J Nutr 116: 1272-1278, 1986. Westerterp-Plantenga, M. S., et al. Sensory and gastrointestinal satiety effects of capsaicin on food intake. Int J Obes 29: 682-688, 2005. Yoshioka, M., et al. Combined effects of red pepper and caffeine consumption on 24 h energy balance in subjects given free access to foods. Br J Nutr 85: 203-211, 2001. Ryan, E. D., et al. Acute effects of a thermogenic nutritional supplement on energy expenditure and cardiovascular function at rest, during low-intensity exercise, and recovery from exercise. J Strength Cond Res. 23(3):807-17, 2009. Stohs, S. J., et al. Effects of p-synephrine alone and in combination with selected bioflavonoids on resting metabolism, blood pressure, heart rate and self-reported mood changes. Int J Med Sci. 8(4):295-301, 2011. Stohs, S. J., et al. A review of the human clinical studies involving Citrus aurantium (bitter orange) extract and its primary protoalkaloid p-synephrine. Int J Med Sci. 9(7):527-38, 2012. Sale, C., et al. Metabolic and physiological effects of ingesting extracts of bitter orange, green tea and guarana at rest and during treadmill walking in overweight males. International Journal of Obesity 1:10, 2006. Preuss, H. G., et al. Citrus aurantium as a thermogenic, weight reduction replacement for ephedra: An overview. Journal of Medicine 33:1-4, 2002. Kaats, G.R. et al. A 60day double-blind, placebo controlled safety study involving Citrus aurantium (bitter orange) extract. Food and Chemical Toxicology 55:358-362, 2013. Liu F, Kim J, Li Y, Liu X, Li J, Chen X. An extract of Lagerstroemia speciosa L. has insulin-like glucose uptake-stimulatory and adipocyte differentiation-inhibitory activities in 3T3-L1 cells. J Nutr. 2001 Sep;131(9):2242-7. Judy WV, Hari SP, Stogsdill WW, Judy JS, Naguib YM, Passwater R. Antidiabetic activity of a standardized extract (Glucosol) from Lagerstroemia speciosa leaves in Type II diabetics. A dose-dependence study. J Ethnopharmacol. 2003 Jul;87(1):115-7. Hayashi T, Maruyama H, Kasai R, Hattori K, Takasuga S, Hazeki O, Yamasaki K, Tanaka T. Ellagitannins from Lagerstroemia speciosa as activators of glucose transport in fat cells. Planta Med. 2002 Feb;68(2):173-5. Hattori K, Sukenobu N, Sasaki T, Takasuga S, Hayashi T, Kasai R, Yamasaki K, Hazeki O. Activation of insulin receptors by lagerstroemin. J Pharmacol Sci. 2003 Sep;93(1):69-73. Unno T, Sugimoto A, Kakuda T. Xanthine oxidase inhibitors from the leaves of Lagerstroemia speciosa (L.) Pers. J Ethnopharmacol. 2004 Aug;93(2-3):391-5. Suzuki Y, Unno T, Ushitani M, Hayashi K, Kakuda T. Antiobesity activity of extracts from Lagerstroemia speciosa L. leaves on female KK-Ay mice. J Nutr Sci Vitaminol (Tokyo). 1999 Dec;45(6):791-5.